I had to read it three times! THREE TIMES! I wasn’t sure I had read it right the first time, or the second time…in fact I’m going to check it again before I commit it to type in this blog. You’re wondering what I am blathering on about? 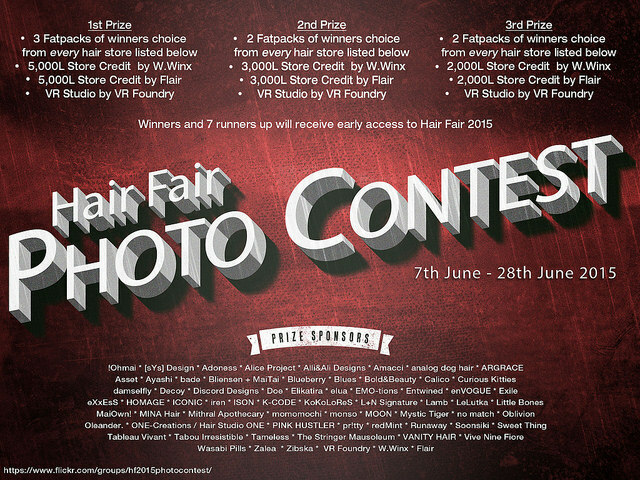 The prizes for the Hair Fair 2015 Photo Contest. In fact I’ll add the poster so you can read it several times yourself! You can enter up to 5 pictures and so far I’ve entered two, the one at the top of the page and the one below. Good Luck to everyone who enters. Happy snapping! Gonna ask a real dumb question – read the rules – so I can wear any hair???? it is! those prizes are epic! Can’t wait for the Hair Fair to open – it’s my favourite annual event.